Offering you a complete choice of products which include courier management software. 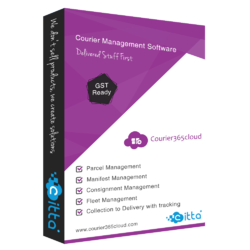 The main objective of Courier Management Software is to manage the details of Courier, Customer, Delivery, Bill, Payment, Courier. The software is totally built at the administrative end and thus only the administrator is guaranteed the access. The purpose of the Courier365cloud is to build an application program to reduce the manual work for managing the Courier, Customer, Email Notification, Delivery. It tracks all the details about the Delivery, Bill and Payment.